If you subscribe to our philosophy of ultra lightweight travel, you'll no doubt be travelling with minimal clothing. Clothing is heavy and bulky and you find yourself questioning whether you can even afford to pack more than one spare change of socks and underwear. Carrying so little spare clothing, the issue of laundry inevitably arises more frequently and you will just have to contend with this one inevitable downside of travelling ultralight (unless you're willing to totally neglect your personal hygiene). If you're one to use laundry services like those operated by your guesthouse, laundry ladies or by coin-operated laundry machines, those frequent bouts of laundry could start costing you more money than they should. Fortunately, there is a much cheaper option and it's also not very time-consuming or labor intensive; the art of hand washing your clothes. The skill of hand washing clothing is not a difficult one to acquire and once you’ve done it successfully the first time, you may never look back to laundry ladies, washermen, Laundromats or any other laundry services. Other than the money-saving benefits and the improvement in your degree of self-sufficiency, hand washing is a very useful skill for times when you simply don't have access to laundry services. If you're the kind of traveller that likes to venture off the beaten path or go camping, you'll definitely want to know something about the method of hand washing. A plastic bucket or basin of some sort is useful so that you can give the clothes a good soaking. If you’re camping out, then a clean flowing stream or river with easy access is ideal. You can also wash your clothes in a sink or bathtub but you’ll need to find a way to plug the drainage hole if it doesn’t already have a stopper. 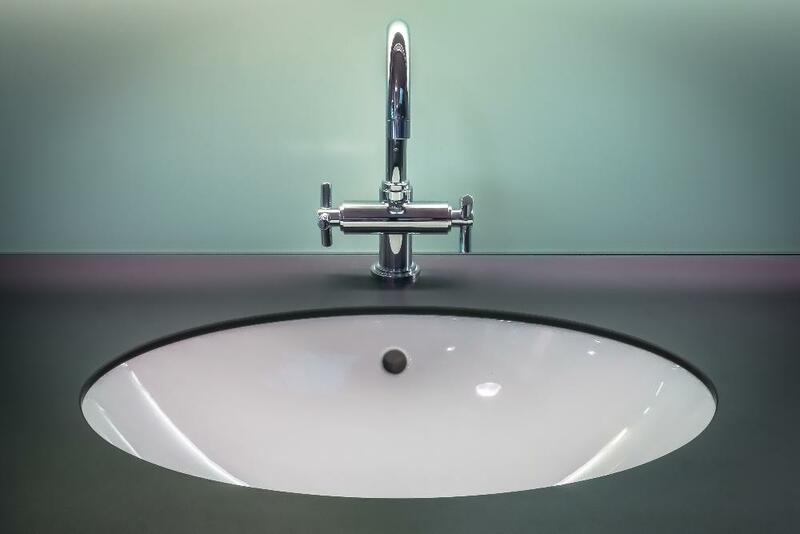 You can of course plug any sink with a wad of tissue paper or a rag but if you want to be more prepared, it might be no harm to invest in a portable sink stopper. Many savvy travellers are carrying these nowadays. Many people like to just toss their dirty clothes inside a waterproof ALOKSAK bag. This is option is particularly useful for camping, when you may not have access to a sink or a bucket, but make sure you get the large size (16 x 24'') so it can hold all your laundry. You’ll also need some mild detergent for which we often use those cheap single use sachets that are often available in convenience stores. A better option than powdered detergent however is the best-selling Dr. Bronner’s magic soap. This is a highly concentrated organic liquid soap so one small 8 oz bottle will go a long way. It's also environmentally friendly. and being a multi-purpose soap, it can also used for brushing teeth, shaving and shampooing hair. It's popularity among lightweight travellers speaks for itself. Finally, especially if you’re using non-organic detergents, a pair of rubber gloves may be necessary if you have sensitive or irritable skin. Hot water dissolves detergent more quickly and has more cleaning potential than cold water, though advances in detergent technology mean that hot water is becoming less important for getting clothes clean. While effective at cleaning, hot water has several downsides. It can cause wrinkling and stretching and can wash out colours in many fabrics. It can also set many protein-based stains. There’s also the problem that it’s not always readily available, especially if you’re staying in humble rural guesthouses in poorer countries or if you’re camping out. Heavily soiled items, non-protein based stains, items with lighter/faded colours, non-delicate items. Cold water can help to preserve colour and guard against shrinkage in many fabrics. It’s especially useful for washing delicate or very lightly soiled items that aren’t dreadfully filthy. It’s better than hot water for dealing with protein-based stains. Cold water also uses less energy and is more environmentally friendly. The bottom line is that it works, as is exemplified by the fact that people all over the world make do by washing their clothes in cold rivers. Lightly soiled items, protein-based stains, washable silk fabrics, lingerie, swimwear, strongly coloured fabrics and washable woolens to prevent shrinkage. As with machine washing, coloured items should be separated from whites with hand-washing also. However, it’s better to avoid this problem in the first place by not packing any white clothes. That means no white socks, no tighty whities and no white t-shirts. Not carrying whites also comes with the additional benefit that you won’t have to do laundry as often either, since whites do a very poor job at concealing dirt and grime. There is no 100% correct method for hand washing clothes that is set in stone. For your first time though you should follow some guidelines like the ones we've outlined below. After that you can experiment and refine your own method from these rough guidelines. 1. Based on the condition and nature of the clothes to be washed, decide whether to use hot water, cold water or lukewarm water. 2. Fill the container (sink, bucket, Aloksak Bag, etc.) with water and add about 10 drops of Dr. Bronner's magic soap or your powder detergent in the correct concentration, according to the instructions on the packet. 3. Fully dissolve the detergent in the water by swirling and agitating the water until suds begin to form. 4. Pre-treat any stains on each garment by applying extra liquid detergent to the area and then rubbing that area of the fabric against itself gently after dipping it in the soapy water. 5. Immerse your clothes in the water and start swirling them around and kneading them gently to push the detergent through the fabric. Do this for around 3-4 minutes. You're essentially imitating the action of a washing machine in this step. 6. 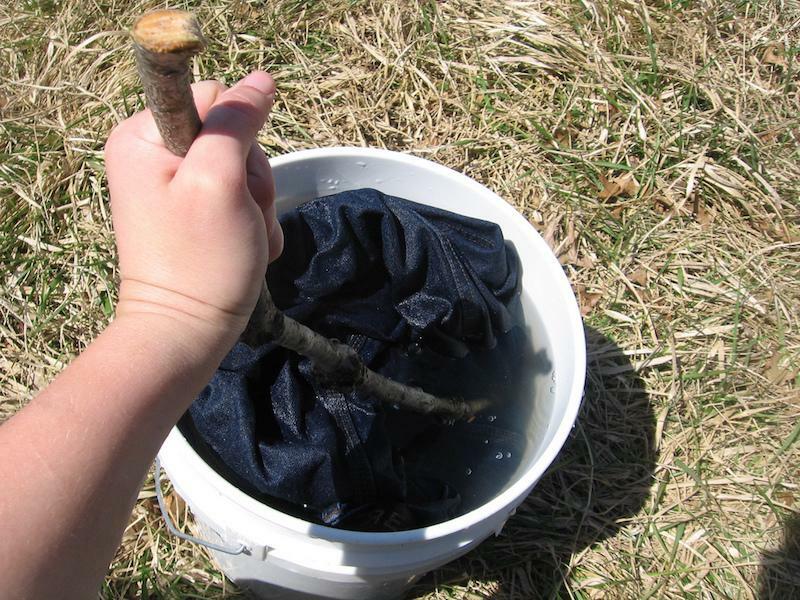 Leave the clothes to soak in the water for 10-30 minutes, depending on how dirty they are. 7. After soaking, pour out the dirty water inside the container down the drain. Next, begin rinsing and squeezing out each of your garments individually under running water. 8. Keep rinsing and squeezing each item of clothing until the water runs clear from each and you’ve removed all the detergent from the fabric. 9. You're done! The next step is to dry your clothes. 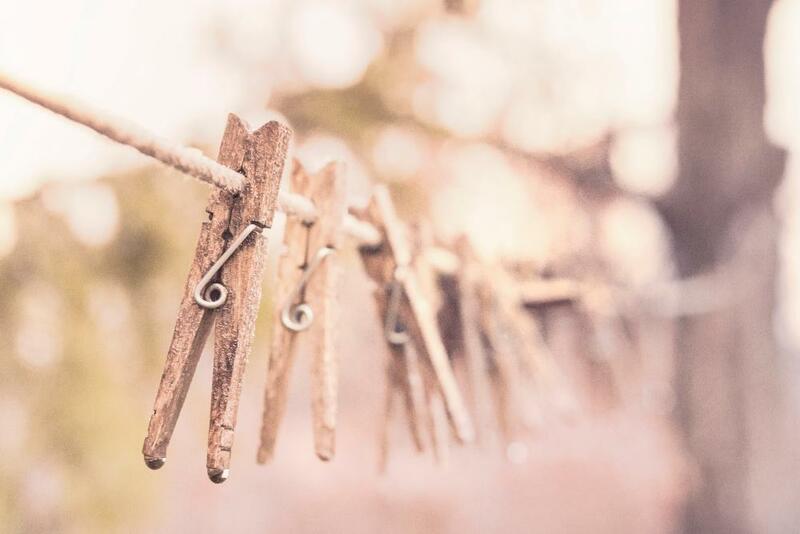 Drying the wet clothes will be easier and quicker in hotter climates but even in colder climates you can speed up the drying process by exposing the clothes to a good stiff breeze. The first step is to wring out as much water as you can from each item by hand. Only wring out the more robust items with gusto because wringing out delicate items too aggressively can cause them to lose their shape. If you have a towel, you can absorb additional water from an item by laying it flat on a towel near one end and then rolling it up tightly inside the towel. After removing as much excess moisture as you can from each item, it’s time to hang the clothes out to air dry. If you’re staying in hotels or guesthouses, open rooftops or balconies are usually the perfect place for this. However, in bad weather, provided you have sufficient space in your room and a good ceiling fan, you may be able to set up a washing line inside the room and dry the clothes under the fan. Regarding a washing line, many travellers carry a portable elastic washing line, but you can also easily improvise one if you carry a length of strong cord. The elasticated lines are really handy though because they often come with in-built pegs or clips for hanging your clothes. 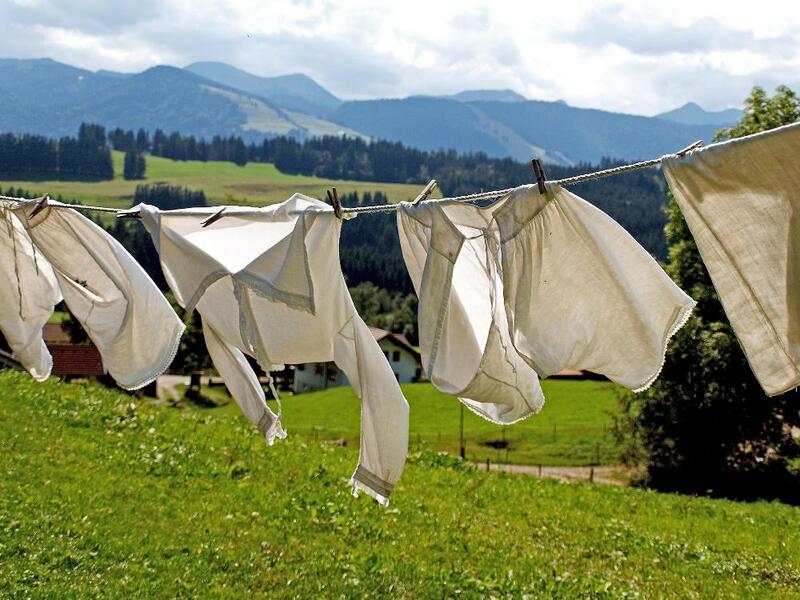 Lacking a washing line, a hot, sunny spot on top of a wall or balcony railing can also work but you might want to flip the clothes over like a pancake after they’ve dried on the upper side. Remember that clothes will dry faster if you can maximize the surface area exposed to the sun and any wind that may be blowing. Expect cottons and wools to take the longest to dry, while synthetic fabrics such as polyester will dry much faster. Garment thickness will also influence how long items take to dry with thicker items of the same fabric taking longer. So there you have it. That more or less covers the subject in a nutshell. Remember also, even if you're carrying very few items of clothing, you don't have to do laundry on an ultra-frequent basis. It's okay to wear the same clothes for a few days in a row; if anybody notices, your excuse is that you're travelling. Most people probably won't even notice anyway. So give hand washing a try folks if you haven't already and let us know how it goes. Do you know any other ways to save money on laundry? We would love to hear other ideas. If you've any comments, questions or concerns, please get in touch with us below.